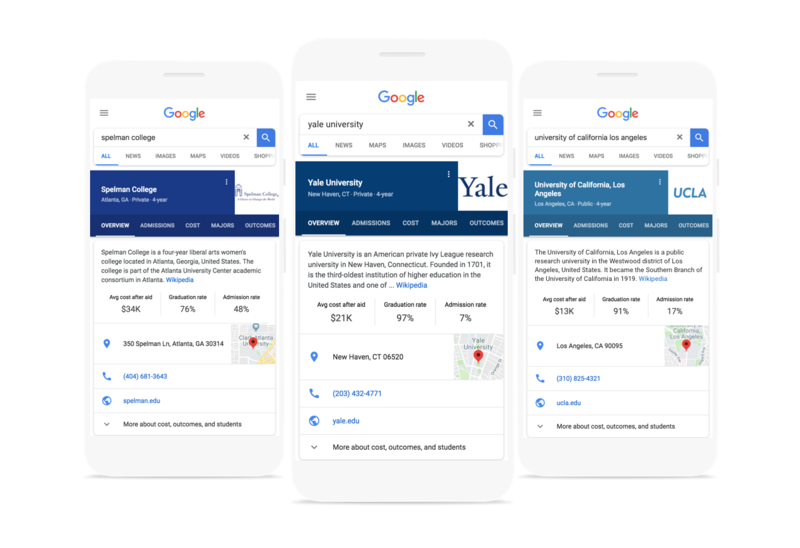 Google Search is getting an update today that will put data about colleges front and center when you search for a school’s name. The idea here is somewhat similar to what Google did with its job search feature. In this case, the company aggregates data about a school that’s typically hard to find and then presents it in a single widget. One caveat here, though, is that this only works for four-year schools. So if you’re looking for data about community colleges, for example, this new tool won’t help you. Finding all of this information about cost, acceptance and graduation rates, available majors, stats about the student body and other details like the typical annual income of graduates after 10 years can be very time-consuming. This new widget puts all of this data right into the sidebar (on desktop) or at the top of the page (on mobile). Google is mostly getting this data from the U.S. Department of Education’s College Scorecard and Integrated Postsecondary Education Data System. The company notes that it worked with research and nonprofit organizations, as well as high school counselors and admissions professional to design the new experience. This new feature is now live and should automatically pop up when you search for any four-year school in the U.S.